BFD operates five Type 1 engines and two identical 100-foot ladder trucks out of five strategically located fire stations (Stations 91–95) within the city. Each apparatus is fully staffed 24 hours per day, seven days per week. There is one engine located at each station, with one truck located at Station 91 and another at Station 93. 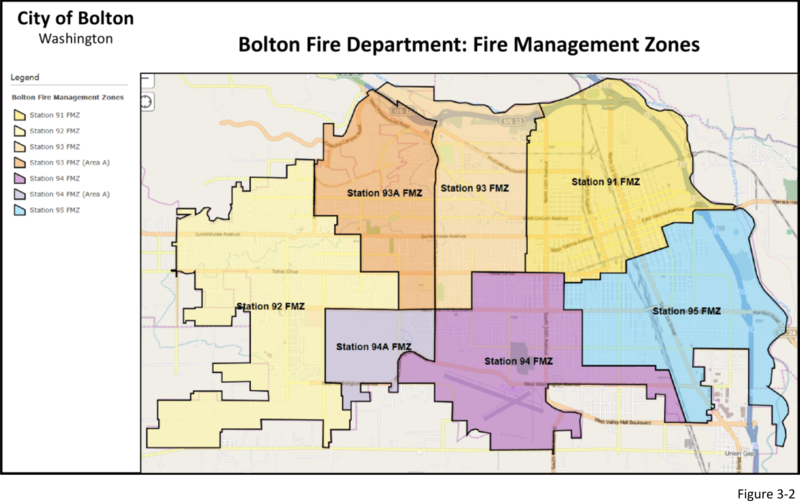 The majority of locations within the city can be reached within 4 minutes of each fire station. The five stations serve seven fire management zones (FMZ); with Stations 93 and 94 each having two FMZs. Each station’s FMZ represents those geographical areas that are the closest—in terms of response times—to that particular station (see Figure 3-2). Each apparatus is staffed with at least one certified EMT-Paramedic, and fully equipped with advanced life support (ALS) equipment and supplies. Each truck company carries extrication equipment and a hydraulic tool for heavy rescue.